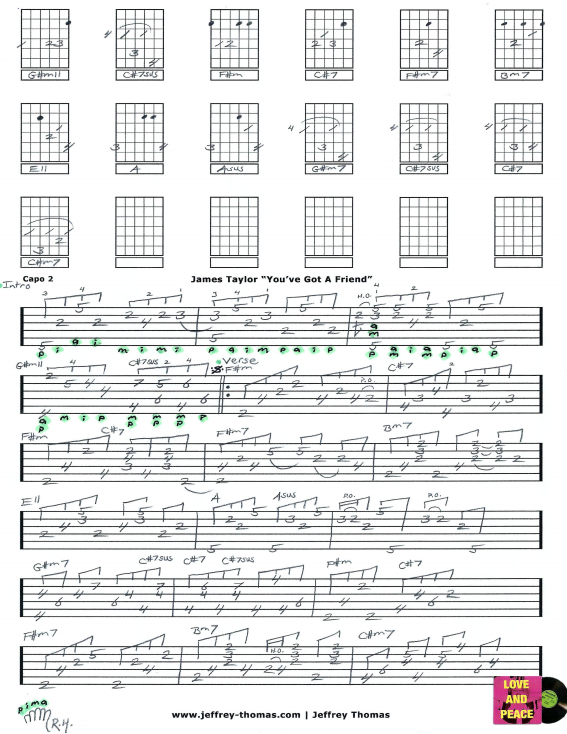 James Taylor You’ve Got A Friend Free Guitar Tab by Jeffrey Thomas. Learn to play this classic acoustic tune with my custom guitar tab. The original recording has 2 guitar tracks and one is open while the other is capoed at 2. I decided to write my guitar tab following the guitar capoed at the 2nd fret. Many of my students request James Taylor tunes and really like his style of songwriting and guitar playing. If you would like the full guitar tab for this tune let me know. Just send in your email address through the form provided and I’ll send it to you. Want to improve your fingerpicking skills? Make sure to fill out the Schedule A Free Lesson form to set up your free Skype guitar lesson. “You’ve Got A Friend” was actually written and recorded by Carole King first in 1971. Find more great online guitar tabs on my tab, video and blog pages.